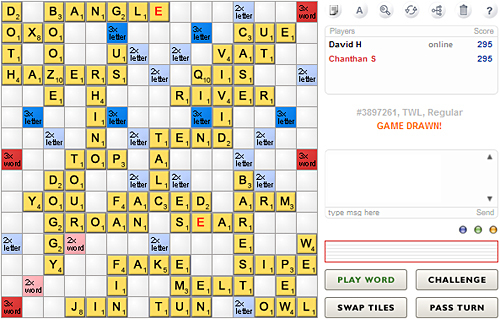 Facebook has a cool Scrabble application called Scrabulous. I play regularly with a bunch of friends. I just played the most fun game ever though. The game below was super close. I thought I'd lost, but then the game gave me three points at the end because I used all my tiles and Chanthan still had three tiles left. The game ended in a draw. LOL!